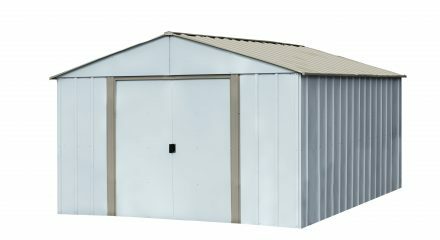 The Oakbrook Steel Shed from Arrow features a high gable roof for extra storage and headroom. Plus the shed comes with a floor frame kit in the box! With its wide door opening, your items are accessible and easy to move in and out. A Mid-wall brace & double-braced sliding doors provide extra strength. Baked-on enamel paint provides a durable finish. All parts are numbered, pre-cut and pre-drilled for simple assembly. *Wind and snow loads assume a securely anchored frame according to local building codes and ordinances. Local code requirements vary by location; Conformance to local codes is the responsibility of the purchaser.